The Quatse Salmon Stewardship Centre is one of Port Hardy’s hidden treasures. Hundreds of visitors tour the Centre’s exceptional interpretive gallery and fun-filled habitat displays every year. The Centre is located next to the Quatse Campground on the popular Quatse loop, a circle trail that winds along the Quatse river. The facility serves as an interpretive center, salmon hatchery, and an educational facility for the public and for schools located in Port Hardy on northern Vancouver Island. 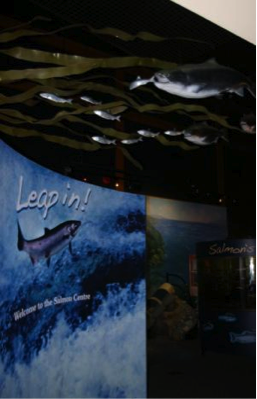 The interpretive gallery features aquaria, a fun-filled habitat display, and information on challenges to salmon survival in freshwater and ocean environments. Centre staff offer tours of the hatchery and regular workshops and courses on stream stewardship, habitat enhancement and fish culture. To learn more, visit the Quatse Salmon Stewardship Centre website. The Quatse Salmon Stewardship Centre is operated by the Northern Vancouver Island Salmonid Enhancement Association, a non-profit organization dedicated to salmon conservation and education on northern Vancouver Island.